Foppiano Vineyards is one of Sonoma County’s oldest family owned wineries and represents an authentic family tradition marked by strength and perseverance dating back to 1896 (bonded winery 312). It is one of the few in California viticulture that can boast that they are six generations old. See page 21 for the winery’s historic timeline. Recently, the family has become dedicated to a renewed commitment to quality in their vineyards and wine program. As the winery patriarch, Louis Foppiano Sr. was old school and resisted change at the winery. Two years ago, at the age of 98, the family took his driving keys away, and they have managed to keep him out of the winery where new equipment has been installed, and out of the vineyards where new viticulture techniques have been instituted. Louis Foppiano Jr., who has a marvelous sense of humor, told me, “We had to keep my father away from the vineyards so he wouldn’t see us dropping fruit. With the latest generation, including General Manager Louis M. Foppiano Jr. and vineyardist Paul Foppiano leading the charge, and with the addition of talented winemaker Natalie West and the management skills of President Todd Arterburn, Foppiano Vineyards has now made remarkable strides toward modernization while still maintaining a thriving tradition. Petite Sirah was first brought to America from France in 1884. The father grape is Syrah and the mother grape is Peloursin, a humble grape from southern France. Since cross-regional breeding of grapes was frowned on in France, Petite Sirah was not accepted there, and found a new home in the United States, where, along with Zinfandel, has become America's own variety. Petite Sirah has survived phylloxera in the 1890s, both World Wars, the Depression, and Prohibition (during which time Petite Sirah was a main ingredient in sacramental wines). Concannon Vineyard was the first California winery to label the varietal Petite Sirah on the bottle in 1964. Over 90% of the California plantings labeled Petite Sirah may be Durif (or “Duriff”)grapes, named after Francois Durif, a botanist at the University of Montpellier, who first propagated it in the 1880s in the Rhone Valley. Durif and Petite Sirah are considered interchangeable synonyms referring to the same grape. Current DNA research at University of California at Davis indicates there are at least three different varieties that go by the name of Petite Sirah. One may be Durif, but two of them definitely are not. The height of Petite Sirah's popularity was in 1978 when more than 14,000 acres were planted. Today, there are less than 3,000 acres with most vines very old and some vines well over 80 years old. The flavor profile of Petite Sirah is similar to Syrah but the wine is not as elegant. Typically Petite Sirah is darkly colored, inky and tannic, with a peppery note and can be very long-lived. 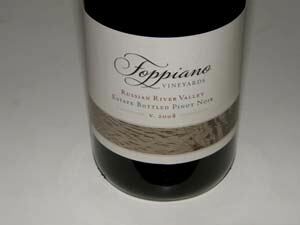 Foppiano Vineyards has been a tireless promoter of Petite Sirah and is a founder of P.S. I Love You, Inc, the advocacy group for Petite Sirah. Paul Foppiano joined the family business in 1998 and has gradually taking over the vineyard management duties. As we walked the vineyards, he explained that farming Pinot Noir at this particular site close to the Russian River was particularly challenging because of the threat of Pierce’s Disease. This warmer site of 150 plantable acres is far enough north to allow Petite Sirah and Zinfandel to thrive, but the proximity to the Russian River allows cooler weather varieties such as Pinot Noir and Chardonnay to grow in some areas as well The temperatures near the river where the Pinot Noir and Chardonnay are grown are as much as ten degrees lower than in the bench lands where the Petite Sirah is planted. Because of the intense heat during the summer, careful leaf pulling is delicately employed on the morning side only to prevent the Pinot Noir grapes from sunburn. The vines are cane pruned to allow to encourage added foliage to protect the grapes from the summer heat. A cover crop program has been instituted to improve the nitrogen in the soils, reduce tillage and erosion, and eliminate the need for added fertilizers. Owl boxes in the vineyard and falcon perches have helped to reduce the rodent population. There are 30 acres of Pinot Noir in vines, with 10 acres planted only four years ago and not currently a part of the winery’s Pinot Noir program. The newly developed acreage is planted to Pommard 4 and 5 clones. Other clones in the vineyard include 2A and Dijon 113, 115, 667 and 777. The winery has acquired new sorting equipment to allow then to properly sort grapes in the vineyard and in the winery. Night harvesting has been instituted. A new press and de-stemmer are state-of-the-art, and new open top fermentors are part of the new commitment, as well as a new French oak barrel program and improved hygiene in the winery’s interior. Rather than rebuild the winery structures, the insides are undergoing a complete upgrade. 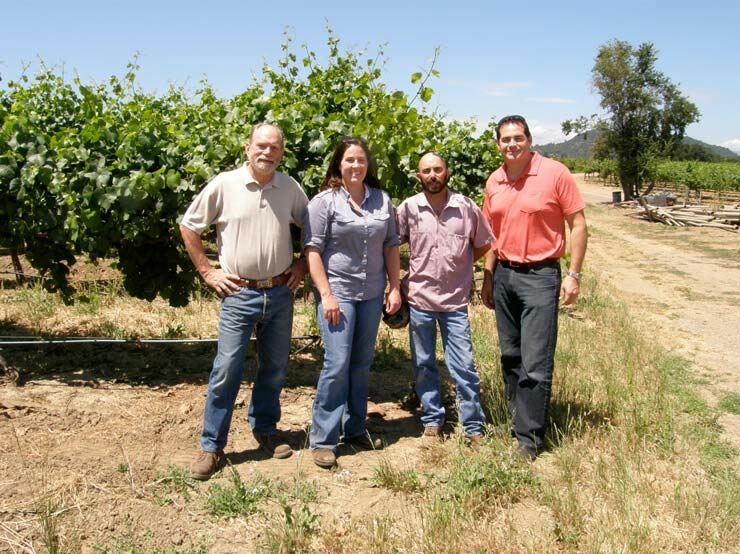 The principals (pictured below from left to right are Louis Foppiano Jr., Natalie West, Paul Foppiano, and Todd Arterburn) are quite proud of the resurgence at Foppiano Vineyards and rightly so. The Foppianos planted Pinot Noir in the 1970s but the grapes were put into their red wine blends. A separate Pinot Noir bottling was started in 2002 but there were quality problems with the wines. In June, 2008, Natalie West was hired as winemaker and this has been a perfect fit for the Foppiano Winery family. Natalie grew up in Healdsburg on a small vineyard in the Dry Creek Valley and attended Healdsburg High School. Her parents farmed old vine Zinfandel and Petite Sirah, and while growing up, she helped with the typical vineyard jobs such as suckering the vines, pruning, picking up pruning brush, and picking fruit. By the time she left for college, she had had enough of vineyard work and had no interest in the wine business at all. She attended University of California at Davis where she studied biological sciences, intent on becoming a medical doctor. During her second year at Davis, her fond memories of the wine country resurfaced and she developed an interest in the Viticulture and Enology Program at Davis. After the second year of college, Natalie worked harvest at Peterson Winery in Dry Creek Valley and found her calling. She returned to Davis, enrolled in the Viticulture and Enology Program and never looked back. After her schooling, Natalie worked as an intern at Clos LaChance Winery in San Martin and then spent time in New Zealand at Montana Wines (Brancott). Returning to California in time for the 2004 harvest, she worked as a lab technician for a year at J Vineyards & Winery before becoming an assistant winemaker at Ferrari-Carano. She feels that her childhood on a vineyard has given her a better appreciation of the life cycle of the vines and an understanding of the seasons and climate in the Russian River Valley. At Foppiano Vineyards, Natalie crafts several varietals including Petite Sirah and Zinfandel, her favorites, and Pinot Noir, Carignane, Cabernet Sauvignon, Chardonnay and Sauvignon Blanc. 14.9% alc., pH 3.77, 800 cases, $25. The grapes were de-stemmed and fermented in five ton open top fermentation tanks. Cold soak lasted 5 days. Aged 14 months in 30% new and 70% neutral French oak barrels. · Lovely scent of Bing cherries, strawberries, baking spices and sandalwood. On the palate, finesse is emphasized over fruit heaviness. Bright and tasty red cherry and ripe strawberry fruit flavors have a subtle confected tone with hints of red licorice and vanilla. The alcohol gives the wine a welcoming richness and is perfectly integrated. Gossamer tannins create an Elvis on velvet texture. Still drank fine the next day from an opened and re-corked bottle. An impressive example of a warmer weather Pinot that hits all the high notes at the right price. Foppiano Vineyards wines are available for sampling at the winery’s tasting room which is filled with historic photos and wine memorabilia. The tasting room is at 12707 Old Redwood Highway in Healdsburg. The wines are also available online at www.foppiano.com. Foppiano is one of the few wineries that welcomes visitors to roam through the estate vineyard unattended. 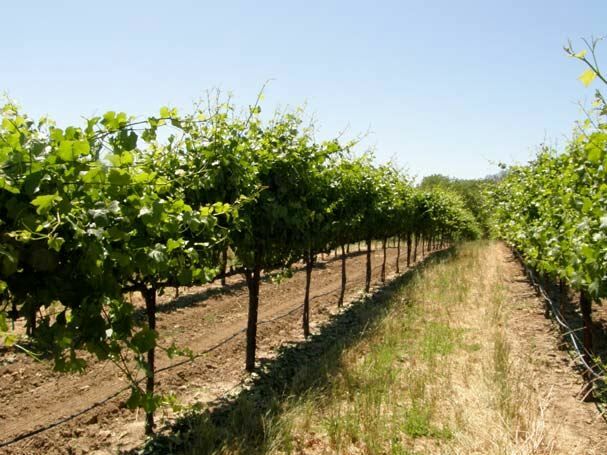 A vineyard tour brochure is offered, giving the visitor a guide to the different grape varieties planted on the ranch. No pretensions or facade here. As a node to the winery’s renaissance, a completely new logo, label and packaging is offered on the newest releases which is very classy. 1855 Giovanni Foppiano emigrated from Italy to New York and traveled to San Francisco looking for gold. 1896 Giovanni bought a working winery, “Riverside Farm,” where Foppiano Vineyards now stands and operates today. He founded Foppiano Wine Company and developed a market for his wines. 1910 Louis A. Foppiano bought the winery from his father and built Foppiano Vineyards into one of the area’s most successful wineries. At the time, everything south of the winery and north in Alexander Valley was planted to pears, prunes and apples. 1919 With the beginning of Prohibition, the market for wine disappeared. 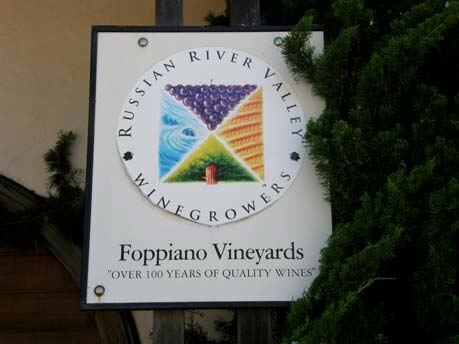 Foppiano Vineyards was kept in business farming fruit and grapes for home winemakers. 1924 Federal agents raided Foppiano Vineyards and forced Louis to dump over 100,000 gallons of the 1918 vintage into a creek in front of the winery. People came from miles around with cups and jars and drank from the creek. 1933 With the end of Prohibition, Louis J. Foppiano, at the age of 23, revived the winery. 1937 A new winery facility was built and Foppiano Vineyards became one of the first Sonoma wineries to bottle its own wines. Louis J. Foppiano was a one-man operation, functioning as President, Winemaker, Director of Marketing and Sales, and Vineyard Manager. He was a dog lover and always had Chihuahuas around. While he was working in the vineyards, they would crawl up his arm and sit on his shoulder. 1941 800,000 gallons of wine was produced annually. 1943 The current winery facility was built. During the war, lumbar was hard to come by, but Louis knew several people who worked in the nearby mills. 1945 The Sotoyome Vineyard adjacent the Foppiano property was bought by Louis. 1946 Louis J. Foppiano founded the Sonoma County Winegrowers Association (which later became the Sonoma County Wineries Association) and was involved in the founding of the California Wine Institute. He was the Director of the Institute for five years. 1960s Fruit trees on the property were removed and Cabernet Sauvignon was planted along with other varieties. Petite Sirah was retained. The business model moved to “premium” wine production. 1969 First vintage-dated bottling of Foppiano Vineyards varietal wines. 1970s-1990s Louis J. Foppiano’s sons Louis M. (Louis Jr.) and Rod joined the business, Louis M. as the Director of Sales & Marketing and Rod as winemaker. A daughter, Susan Foppiano-Valera, has been in charge of hospitality for many years. Two brands were added: Riverside Vineyards and Fox Mountain with Foppiano remaining the premium wine label. Transitioned to a 100% red wine brand. 1994 New Petite Sirah vineyard planted to meet increasing demands for the wine. 2008 Natalie West was hired as winemaker. 2009 COO Todd Arterburn and direct sales manager Darci Feigel joined the Foppiano team. Visit the Foppiano Vineyards’ website for a detailed chronology.